With all the rains earlier in the year and continued wet condition, there are more foliar soybean diseases this year. Brown spot is the most common foliar disease of soybean and is prevalent across the state. Frogeye leaf spot is becoming more common but mostly in the southeastern portion of production in the state. If one or both of these diseases are advancing in your fields, this will increase the potential return from a fungicide this year. Brown Spot: This foliar disease starts in the lower portion of the canopy and moves up the plant, very similar to what we see for gray leaf spot in corn. Soybean varieties vary in their susceptibility levels, but companies do not commonly have ratings in seed books. If your canopy is yellowing and defoliating in the lower portion, this is most likely the cause. Symptoms start as dark brown, irregular spots on both upper and lower leaf surfaces. Lesions typically will have a yellow or chlorotic halo when held up to a back light. Adjacent lesions frequently merge to form irregularly shaped blotches. Leaves become yellow to rusty brown. Symptoms of Brown Spot can also develop on stems and pods of plants approaching maturity. Stem and pod lesions have indefinite margins, are dark in appearance and range in size from flecks to larger areas. 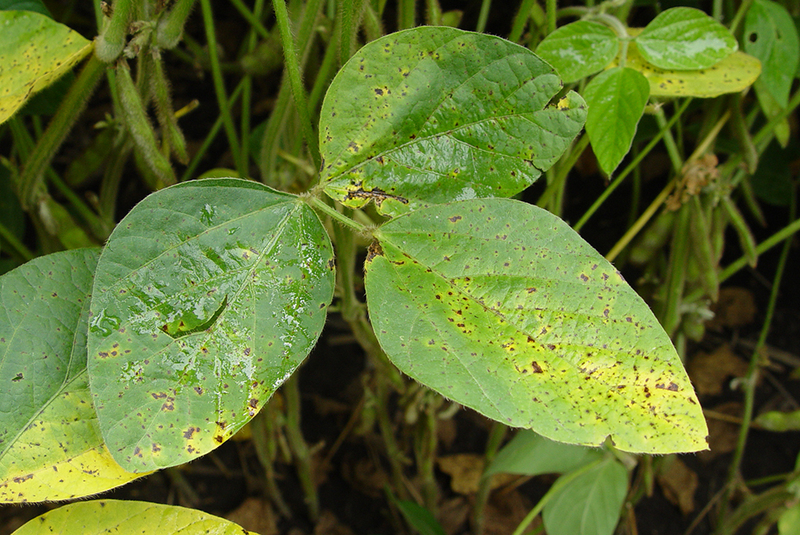 Frogeye Leaf Spot: Infection can occur at any stage of soybean development, but most often occurs after flowering and is typically in the upper canopy. Initial symptoms are small, dark spots on the leaves. Spots eventually enlarge to a diameter of about ¼ inch and the centers of the lesions become gray to brown and have a reddish purple margin. Individual leaf spots can coalesce to create irregular patterns of blighting on the leaf. In addition, stems and pods can also be affected later in the season and will be long narrow dark lesions with flattened centers. Pod lesions will be circular to elongate, slightly sunken and reddish brown in color. Both of these diseases are residue born and will be more severe in fields with continuous soybean or those that were replanted late in 2014 to soybean and then put in soybean again this year. There is a wide range in soybean maturity across the state. If your fields are at the R3 to early R4 growth stage and you're considering a fungicide application, your potential for return will be greater in fields where foliar diseases are present. 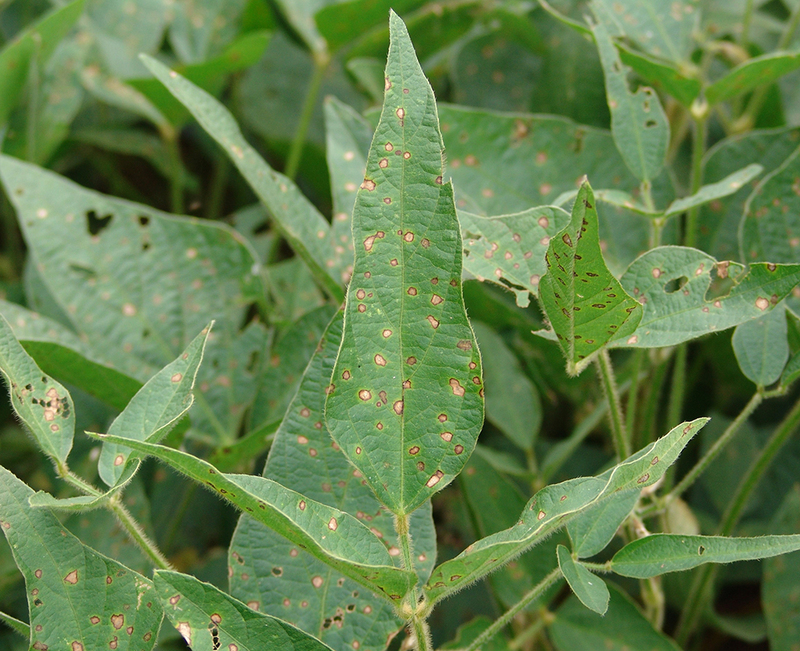 Fields with frogeye leaf spot should be recorded so varieties with resistance can be used in future years. For a complete review of soybean foliar diseases please see Soybean Disease Profiles I: Foliar Diseases (EC1903).